Every organization is looking to reach more people. Companies are looking for more clients, nonprofits are looking for donors, and millennials (people aged 18-33) seem like a great target group. But there’s one problem. Just like all 60 year-olds are not the same, neither are 30 year-olds. Millennials are not an audience. There are about 92 million Millennials in the country. That’s much larger than Generation X or even Baby Boomers. And that generation, according to the White House, the largest and most diverse generation in country. 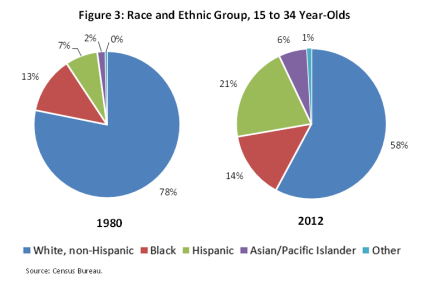 Just take a look at the racial and ethnic breakdown of millennials from the report. According to Pew Research Center, millennials are now the largest segment of the U.S. labor force. Just take a look at Pew’s breakdown of Millennials in comparison to other generations. Or, take a look at the variation in their religious affiliation. So, what is your ideal audience? High school educated? College educated? Working a full-time job? Living in an urban area? All of these factors make a big difference when you’re creating messages and strategies that speak to your target audience. It can mean the difference between finding your audience at a community center, a high-end shopping mall, or a Twitter chat. Of course, there are things that many Millennials have in common. Many grew up with technology, many are politically liberal, and many are unmarried. And those can be helpful for frames when you decide to target that generation. But those factors do not make a homogenous audience for your organization to target. So, when you are building your marketing and communications plan, still consider Milliennials as an audience. After all, they’re young, many have disposable income, and they are one of the largest demographics in the U.S. now. Just remember that they are not a homogenous group: they are diverse just like every other age group. Want new posts sent to your e-mail?